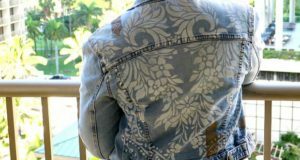 No, I don’t mean reaching behind your back and stenciling blind. Or walking backwards while you paint. Although you could try those techniques! And if you do, let us know how it goes. Today we’ll show to reverse stencil glass on the underside of a glass cocktail table, and why this requires painting your layers of color in reverse – or, stenciling backwards. 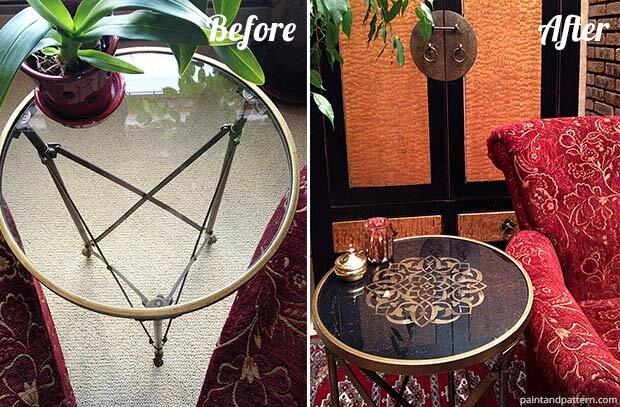 To show how this works, we’ll we begin with clear glass on a little campaign table and transform it from a plain Jane piece into a rich, luxurious gold and black tabletop. 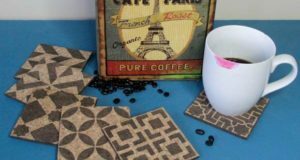 Glass tabletops like this are ideal for stenciling because you can paint under the glass, so no need to worry much about protecting the paint. There are glass paints specially formulated to be permanent on glass, such as Martha Stewart Glass Paint and Pebeo Vitrea 160 . But many paints will not be permanent on glass. This doesn’t mean you can’t paint on glass. Just look for a glass surface that won’t need cleaning, such as the underside of a glass table, the glass in a picture frame or the back side of glass in a cabinet door. The secret to painting on the reverse side of glass is to “think in reverse” if you’re using more than one paint color. What I mean by this is, instead of painting your background color first, as you would on canvas or wood, the background color is the last thing you paint. What a mind-bender, huh? No worries, it’s easy and we’ll show you how. First, thoroughly clean the glass with Glass Cleaner or alcohol. If there is any dust, oil or fingerprint, it will become entombed under the paint and you might see it through the glass. I wanted little copper specks on top of everything. Usually you would do this paint color last, right? But “thinking in reverse,” the first thing I did was spatter copper paint onto the glass by flicking a brush. This made a pretty constellation of little copper specks. 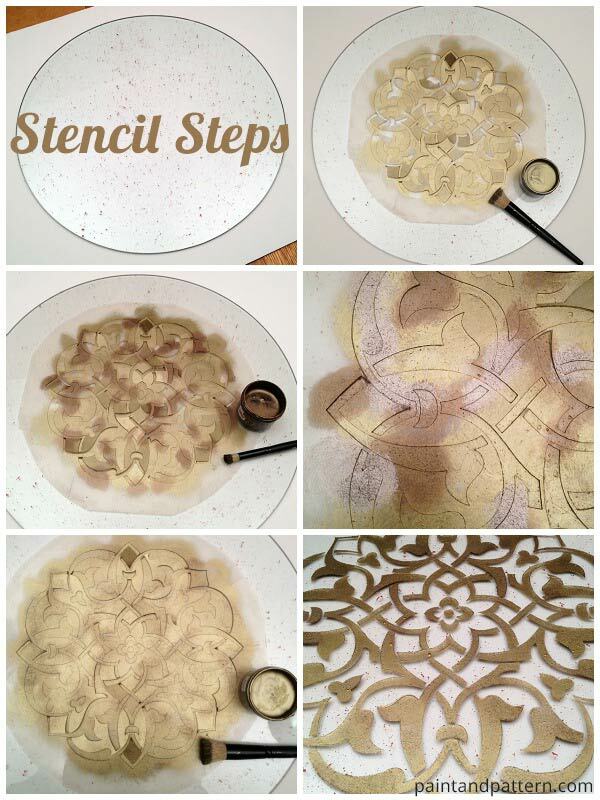 The next layer is the Marrakech Medallion stencil. Using the ruler, I found the middle of the tabletop and placed the center of the medallion there. I envisioned several metallic colors in the medallion, but mostly gold. So I painted Antique Gold Stencil Creme first, but I painted it unevenly and left big empty spots, so the next layers of color could show through. Next I painted Bronze Age, and left a few bare spots where a third metallic layer would peek through. Finally I painted Aged Nickel. I wanted this silver color to be the least prominent of the metallic Stencil Creme colors I used. So, it is painted last and will show up only occasionally through a few remaining bare spots in the stencil. I painted over the whole stencil design with a solid layer of Antique Gold paint, to fill in any remaining light areas. This was because I didn’t want the black background paint to show through anywhere. 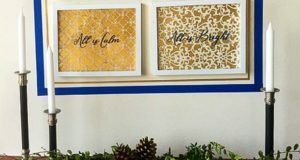 But that’s just a design choice – you could even leave bare spots for the background color to show through for a “fading away” effect on the stencil design. 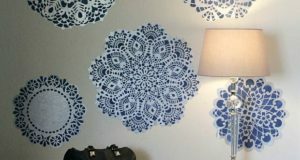 When you’re finished painting the design, remove the stencil and admire! Now our design will be going, going gone! We’re going to paint right over it! It’s okay, this is what we’re supposed to do when stenciling backwards. We paint the background color as the last layer. I painted over everything with Flat Black Stencil Creme. To get good coverage, it was time to bring out the Big Guy – the 3″ Stencil Brush which is a GREAT painting partner. It spreads paint evenly and fast over a larger area. Here is the newly LUXE table in the room. It is SO much more interesting than plain clear glass! 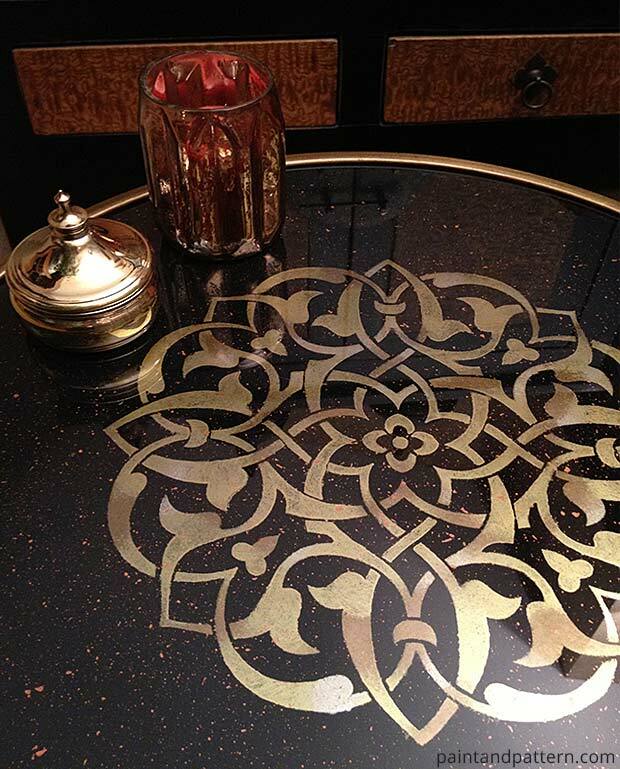 You can see how painting the layers in reverse achieved the plan: a luxurious gold and black tabletop. I use the word “plan” here intentionally. Do you ever pick up a brush and really don’t know what the final result will be? I do, more often than I’ll admit! But painting on the reverse side of glass requires us to imagine the final look and map out a plan to achieve it – what colors we want to use, and in what order. If you’re not sure how your plan will work, test your idea on small remnant glass before tackling something bigger like a tabletop. You can apply a protective coating, although I did not because only the top will be washed to remove occasional fingerprints. Our testing of the stencil cremes shows that glass cleaners may wash these paints off if used on the front of glass, so use these paints ONLY on an exposed glass surface that you won’t need to clean. If you really want to dive into these types of techniques in depth, check out the online Virtual Workshop by Melanie Royals, Antique Mirror and Glass. LOVE this how-to! I especially like the copper flecks at the very beginning. What a difference and it seems like it would take no time at all to make this transformation. Thank you! I love the copper flecks too – details do make the difference! Feels like starry night sky with one big glorious gold star. 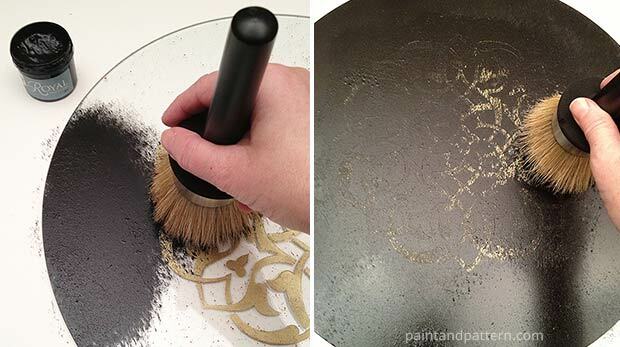 Are you stenciling one color right after another or letting it dry in between? Will it lift off when you remove the stencil? Vicki, the Royal Stencil Cremes dry very quickly. 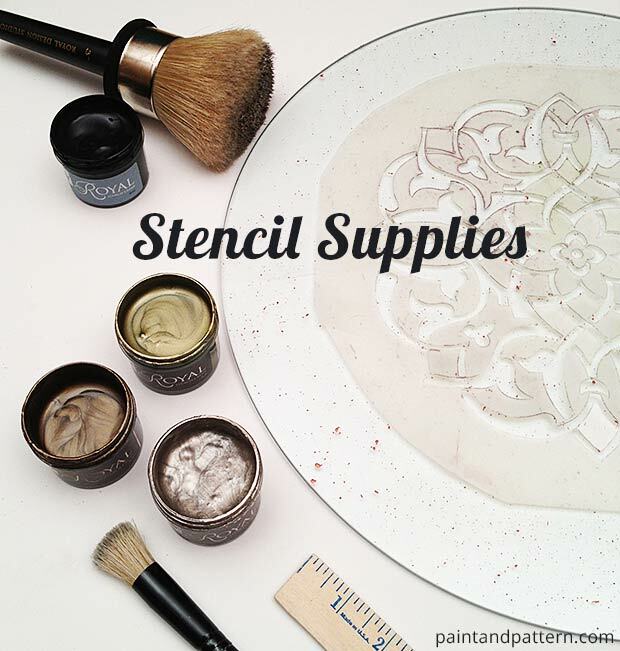 Actually any paint you stencil with will dry quickly if you are off-loading your stencil brush and using a “dry brush” stencil method. So-yes, you can apply one after the other. You would want to let it dry well before turning the glass over-like a day or two. No, the stencil will not lift the paint at all!! lace wigs,bob wigs https://youtu.be/3KO3e4I3_24 Excellente communication, superbe accueil dans magasin. The way to select an air duct cleaning firm? To learn more about our mould remediation course of. truly peaked my interest. I’m going to book mark your blog and keep checking for new information about once per week.